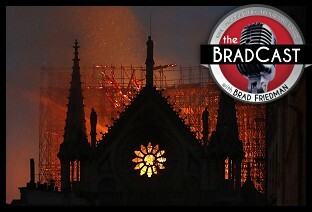 " Institutions Burning (And How YOU Can Help Fight for At Least One of Them): 'BradCast' 4/15/2019	"
« PREVIOUS STORY "Sunday 'Black Hole' Toons"
"Institutions Burning (And How YOU Can Help Fight for At Least One of Them): 'BradCast' 4/15/2019"
Thank you for linking to that essay about Mayor Pete and his book. That was a great example of a synthesis of literary critique of Buttigieg's book and a political analysis of his lived experience as a historical agent. That essay is a true eye-opener and I promise to share it, earning enemies all the way. But that author is right. That essay should be required reading for every progressive who wants a candidate with progressive policy chops and not a skilled salesperson who can play a progressive on TV after his stint at McKinsley's. What was said there can apply to a strong extent to Senator Cory Booker.